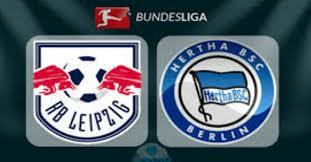 RB Leipzig welcomes Hertha BSC in a game from the 27th round of the German Bundesliga. Allow us to take a look at this fixture and give you our thoughts about it. Right now RB Leipzig are 3rd in the Bundesliga standings with 49 points won so far, continuing their fight for another Champions League qualification. They are 2 points ahead of the 4th Borussia M’gladbach and 3 points ahead of the 5th Eintracht Frankfurt. How you can see, the fight for the Top 4 in the Bundesliga is pretty intense at the moment. So far RB Leipzig have a record of 14 wins, 7 draws and 5 defeats in the league. In their last five games Ralph Rangnick’s boys are unbeaten, though – three wins and two draws. In their last match RB Leipzig achieved an important 1-0 win during the visit to Schalke 04 at the Veltins Arena. The team’s biggest star Timo Werner scored the winning goal after just 14 minutes of playing. Meanwhile Hertha BSC are 10th in the Bundesliga at the moment, having an average season so far. The Old Lady have 35 points won and a record of 9 wins, 8 draws and 9 defeats. In their last five games Hertha won only once – against Mainz 05. They also made one draw and suffered three losses. Hertha’s last game before the international break ended with a defeat. Pal Dardai’s boys hosted Borussia Dortmund at home, but suffered a dramatic 2-3 defeat. Salomon Kalou scored a brace for the Old Lady, but Dortmund clinched the win with goals from Delaney, Zagadou and Marco Reus. These are our thoughts about the Bundesliga fixture between RB Leipzig and Hertha BSC from the 27th round of the league. We believe that RB Leipzig are a heavy favourite here. Good luck!